Here is a guide to scavenging for food and supplies during a disaster. Most of the ideas stem from me wondering what I would do during a zombie apocalypse (a thought exercise that, granted, I probably think about way too much), but as we’ve seen lately in the aftermath of Hurricane Sandy, these are skills that could benefit anyone, even in the most developed of the developed world. I will talk about the tools that are needed, as well as a step-by-step guide to where and how to scavenge. A Vehicle: A functioning vehicle is a benefit when scavenging. If you come across a place with lots of supplies, you will be able to bring a lot more goods back home. You will also be able to take multiple trips to a place and back in a much shorter time. Vehicles require fuel however, so know where the good potential targets are before hand to use your fuel as efficiently as possible. Having someone guard the vehicle while loading is a good idea as well, to prevent someone coming by and swiping your goods. Bags: You know all those plastic bags you’ve been storing under the sink, wondering when you would ever use them? Well, now is the time. These will allow you to carry many more items home, especially if you are on foot. Double-bag them to avoid breakage. Other bags such as backpacks or duffel bags can be used as well. Forced Entry Tools: When scavenging during a disaster, you may need to resort to less-than-legal means to enter a building with the supplies you will need. Here at All Self Sufficient, we don’t condone breaking and entering, but as a thought experiment we will list some of the tools that would be needed in such an event: Bolt cutters, crow bars, a lock pick, or even a cutting torch or explosives can be used to enter a building that would otherwise be impenetrable. A flashlight: In a post-apocalyptic wasteland, you never know when you will need a light source. Even during the day, the inside of some building may be pitch black without a supply of electricity to power their lights. Always have a flashlight on hand with an extra set of batteries. Path Markers: When in an unknown area, it is important to have a way to mark your path. This will let you know where you have been, and allow you to escape an area quickly. Chalk arrows, duck tape, spray paint and glow sticks all work well. Grocery stores will get cleared out fast! Hit ‘em early. 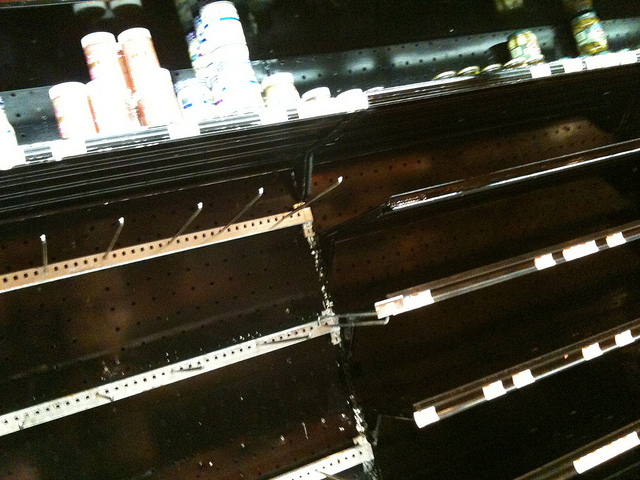 1) Grocery Stores: Food and water are the two most important things that need to be secured in a disaster. As such, grocery stores should be your first target (and they will clear out fast). Grab water (at least a few litres/day for each person) and food (the average adult will require 2000-2500 calories/day). You can prepare ahead of time by creating an emergency water supply and an emergency food supply. Look for high-calorie, high-nutrient, non-perishable food that will last you a long time and give you the most bang for your buck (ie the most calories for your space they take up). Grocery stores also often have things like first aid kits, batteries, lighters and matches and toiletries, all important items to secure. 2) Hospitals and Medical Clinics: These can supply you with first aid kits, painkillers, antibiotics, and various medications and protective equipment. All of these would be very valuable for use or trade should society ever collapse. 3) Gas Stations with Convenience Stores: A convenient spot during good times, these are now your best bet for securing gas, the next most valuable item once food, water and medicine are taken care of. Siphon off as much gas as you can store (these too will run dry fast). Raid the convenience store for water, food, cigarettes (for barter, of course- we at Prepared For That don’t approve of smoking), candy (while not very healthy, it does pack a high-calorie energy punch), and anything else that can be helpful for use or trade. 4) Military Surplus and Camping Stores: These places will have things like guns and ammo, as well as a host of other goods: fishing equipment, camping stoves, tents, animal traps, binoculars, fire starters, water purification tablets, flashlights, knives, crossbows, etc. The list goes on and on. A true gold mine. 5) Gun Stores: These can supply you with guns and ammo. Make sure they are empty before attempting to enter though, as anyone inside would probably be the most well-armed guy in ton. 6) Hardware Stores. Another source of valuable items. Tools for carpentry, plumbing, gardening and farming can all be found here. Gasoline and propane may be on hand as well. 2) Form a Plan. Create a plan with your group for the mission. Who’s going in? Who’s watching the car? Where is the meet up spot if things go bad? What are some contingency plans if certain situations arise? 3) Enter the building. If it is locked, some of the forced entry tools may be needed (as a pure thought exercise, of course). Learning to pick locks would give you a valuable skill during the apocalypse. Consider entering through the backdoor, to draw less attention to yourself. If you set off an alarm, it’s usually best to leave immediately, unless you are particularly desperate. 4) Gather Supplies. Once inside, quickly check the area and then start gathering your supplies. Stay in groups and never end up alone- you’ve seen the horror movies. Grab as much as you can, as you never know what will be available in the future. 5) Be Quiet! Keep your profile as low as possible. 6) Get Out Fast! Don’t stay for longer than you need to. Pack up and head back home as soon as you’ve finished what you came to do. If these guide lines are followed, your scavenging missions should last much longer, and you just might get to fight another day. Next PostShould You Drink Your Own Urine in a Survival Situation? I agree Lou. I’d avoid almost all of the places in the article because everyone would be going to those places and you will find yourself in a potentially dangerous situation – if there’s anything left to fight over. I would try schools. As a teacher I know that there are large amounts of food stored near the lunchrooms 12 months/year. Most of the goods are in No.10 cans and plastic buckets. That’s also where they usually keep the blue water bottles for the water coolers. I live in NYC and we also have at least one medical clinic on each block. Rather than going to a hospital, I’d try the clinics and doctors’ offices for supplies. I’m sorry, but I strongly disagree about where to scavenge. All of the places you mention will be the very first to be cleaned out. If not cleaned out by looters, they will have been cleaned out by employees with keys to the front door. The trick is to think of places that are far less likely to have been looted. A vending machine on a non retail setting for example. the vacated home of a local police officer where ammo might be found. For hardware and tools, a small manufacturing business. You get the idea. And never forget that scavenging is LOOTING.